Did Churchill Underrate Warship Vulnerability from the Air? The Churchill Project - Hillsdale College > Articles > Truths and Heresies > Churchill in WWII > Did Churchill Underrate Warship Vulnerability from the Air? Churchill has long been criticized for the sinking of HMS Prince of Wales and Repulse by Japanese aircraft three days after Pearl Harbor—and for failing to realize how vulnerable warships without fighter cover were to air attack. The Churchill Project asked two eminent military historians to consider these arguments. They conclude that the decision to sail those ships into harm’s way was that of their commander, and that Churchill, who acted at the advice of naval experts, was well aware of their vulnerability. Churchill warmly supported the government’s decision in 1936 to begin building new battleships when treaty restrictions lapsed at the end of the year….He publicly endorsed the Admiralty’s view that the battleship was still a critical element of British sea power. The future of the capital ship [battleships, battlecruisers] was more controversial than ever, but the Admiralty remained confident that innovative designs and efficient anti-aircraft defences would render battleships relatively safe from modern forms of attack. When Churchill sent Prince of Wales and Repulse to Singapore, he did not expect them to come under aerial attack. His decision was taken in October 1941, when Japan was not yet committed to war. Churchill sent these ships to serve as a deterrent, a symbol of British power, and a warning that Britain and the United States were acting in concert. He hoped their presence in the Far Eastern theatre would persuade Japanese leaders to think twice before embarking on war. Unfortunately, the deterrent failed. But Churchill knew these ships were vulnerable. When Japan attacked on 7 December 1941, his first thought was to send Prince of Wales and Repulse to join the remnants of the U.S. Pacific Fleet at Pearl Harbor. It was the commander on the spot, Vice-Admiral Sir Tom Phillips, who decided to sortie from Singapore in hopes of disrupting Japanese landings on the Malay Peninsula. ​I consulted the Naval Staff History about ships damaged and sunk in the April-May 1940 Norway Campaign. The following are listed as “damaged by bombs,” i.e., not by gunfire from shore batteries or enemy vessels: one battleship (HMS Rodney, slight bomb damage); one aircraft carrier (HMS Furious, damage to turbines, near miss by bombs); eight cruisers (one sunk); five destroyers (one sunk); three sloops (one sunk). Total losses and damage from all types of attack in the Norway campaign were two battleships, two aircraft carriers (one sunk), ten cruisers (two sunk), twenty destroyers (eight sunk) and three sloops (one sunk). In addition, four submarines were sunk and two damaged, none by aircraft. One cruiser, HMS Effingham, ran aground and was torpedoed by an accompanying destroyer. What does this prove, if anything? I would suggest that the first naval campaign of the war showed that air power was effective in the close confines of fjords, where ships did not have room for manoeuvre, and aircraft might only be sighted at the last moment. In the open waters of the Atlantic, i.e., off the Norwegian coastline, air power was not notably effective. Ships had room to turn and twist. Near misses were almost as effective as hitting a ship in terms of damage, but not in sinking her. The importance of anti-aircraft armaments was realised, but despite Churchill’s proclamations in Parliament, the Royal Navy was woefully short of them when war came. The same was certainly true as late as December 1941, when Prince of Wales and Repulse were sunk by Japanese aircraft off Malaya. My own view is that Churchill was no more culpable (and actually much less so) than the senior leadership of the Royal Navy. Certainly, they were aware in the Mediterranean that they were very short of anti-aircraft defences at Malta and Alexandria—and this was apparent during the mobilisation of the Fleet during the 1938 Munich crisis. However, that is rather a case of post hoc ergo propter hoc. With the advantage of hindsight—knowing what was going to happen at Taranto, Pearl Harbor and off Malaya—it is easy to see that the Royal Navy was short of anti-aircraft defences and vulnerable to dive bombers (but not really to ordinary bombing). Christopher Bell comments capably above on the Spanish Civil War. I am not aware of anything that occurred in the Sino-Japanese War or Abyssinian War which could have warned us of the vulnerability of warships from the air—of course, neither of these really involved a naval campaign. In World War I little thought had been given to air attack on battleships. The only episode that might have given some warning might be the famous Billy Mitchell dive bombing destruction of a stationary target in 1921. However, naval officers might well have argued that such a target was neither in motion nor firing back. 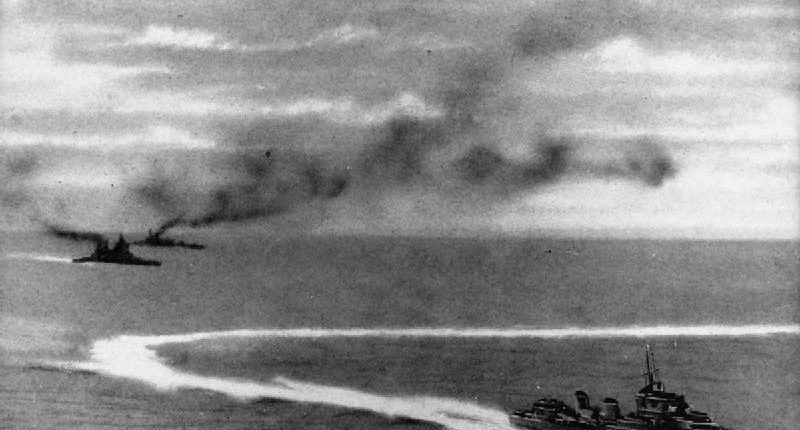 Even in World War II, broadly speaking, very few capital ships were sunk by air power outside harbour. Yes, Prince of Wales and Repulse, and later Japan’s Musashi and Yamato, all took massive hits by both bombs and torpedoes. In November 1942, the battleship Hei was sunk by torpedoes after heavy gunfire damage; and in September 1943 the Italian battleship Roma was sunk by German glide bombers on her way to surrender at Malta. In general terms, however, air power was usually a way to damage and slow a battleship, while sinking her was chiefly the job of gunfire. Christopher M. Bell is a Professor of History at Dalhousie University in Halifax, Nova Scotia. He has published widely on twentieth century naval history. His most recent work is Churchill and the Dardanelles. Robin Brodhurst, a military historian, is author of Churchill’s Anchor: The Biography of Admiral Sir Dudley Pound. He is presently editing a volume of papers and speeches by Field Marshal Lord Bramall, former Chief of Defence Staff and Chief of the General Staff.